The Filling Station Microbrewery, Morning at Maggies Omelette Shoppe, Mackinaw Brewing Company, and Tony's I-75. Regular readers know I love bacon. 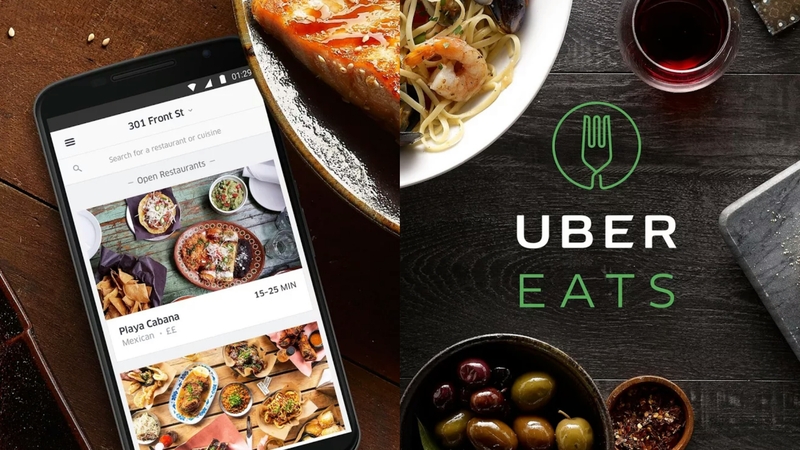 I mean, I love anything pork-related, but bacon and pork belly? Be still my cholesterol-clogged heart. 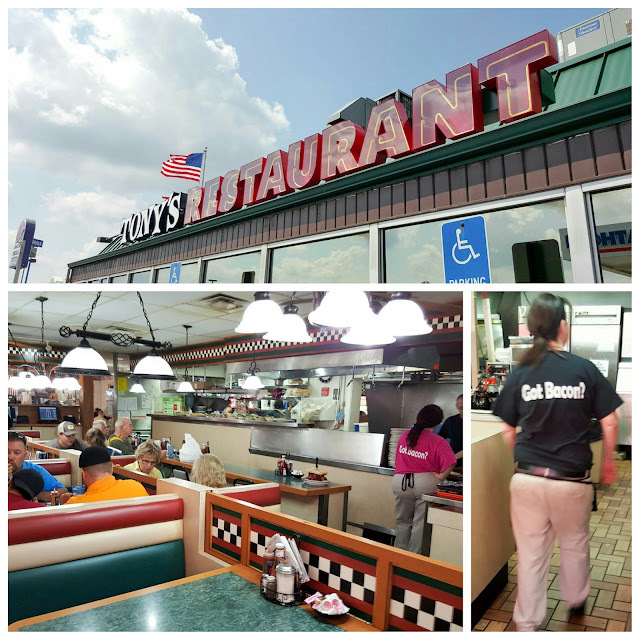 So when I was in Michigan, I knew I had to stop by Tony's in Birch Run to try their BLT. I don't normally order simple BLT's. But when I do, I go big or go home. 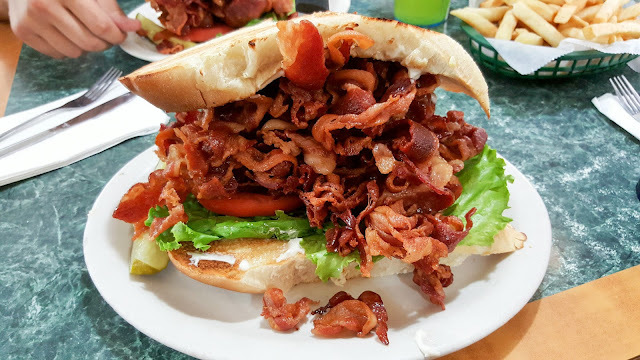 What's so special about Tony's BLT? We're talking abut a joint that serves over 1,000 pounds of hash browns on an average weekend. More importantly, they serve 5 and a half tons of bacon weekly! But before we get to the show stopper, let's check out some of their other goodies. 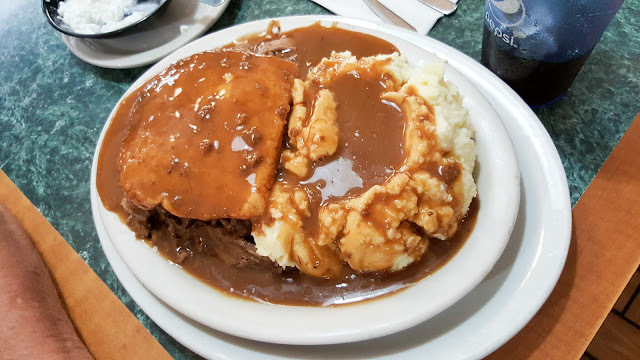 The hot beef sandwich is served open face and draped with rich gravy, which cascades over tender beef and homemade mashed potatoes. Leftovers for days and a food coma to boot! Thinking that she could grab a few strips of bacon off of my plate (was she joking? ), the GF opted for a simple grilled cheese. This was a bit disappointing in that the cheese was not fully melted. 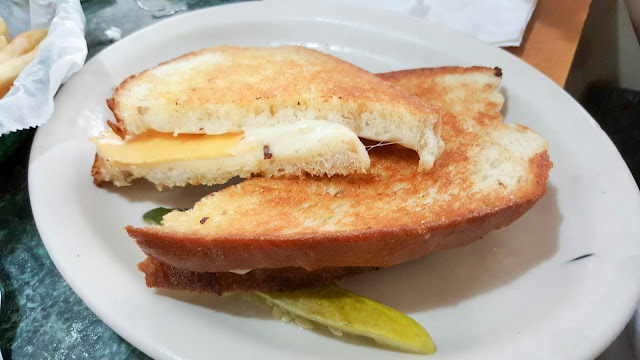 Still, it's hard to completely mess up grilled cheese - the bread was well toasted and sufficiently buttered. 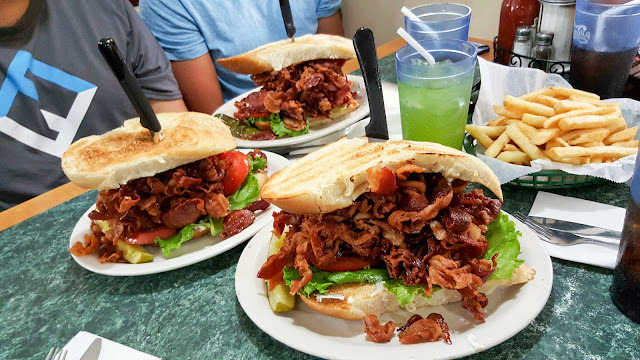 But really, we're here for the BLT. We had a few friends with us, so check out these heart stoppers. Did I mention that Tony's served 11,000 pounds of bacon per week? Insane. We definitely got a few envious (disgusted?) stares our way. What I was most surprised about? How good the BLT was. Yes, I knew I'd be happy with the bacon alone. But the complement of fresh greens, ripe tomato, and a generous slab of mayo between two thick slices of toasted Italian bread was just right for this portion of porky goodness. And the bacon? 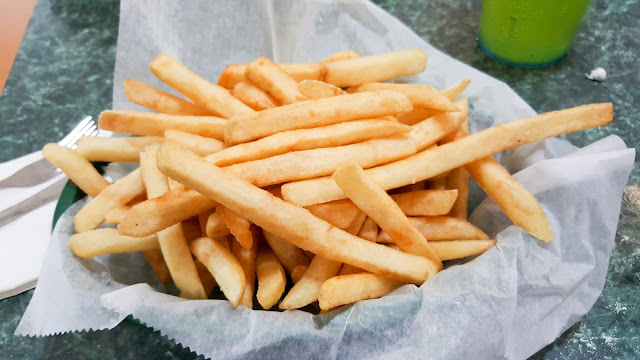 Amazingly thick and crispy. It was good enough that I could have easily finished this behemoth. But I could feel some judgement coming from my compatriots. But let it be known that I enjoyed bacon for breakfast the next few days! This was rounded off by a basket of fries that was shared by all. While it wasn't seasoned, they were crisp on the outside and creamy within. So if you're ever by Birch Run, I'd highly recommend you stop by Tony's I-75. I know the next time I'm in the area, I'm going to have to tackle their banana split. You've seen how they do justice to the BLT. If you can imagine this applied to a banana split, you'll get a sense of what to expect. Life goals people!